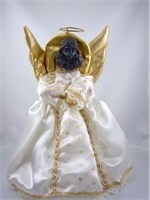 Warm the cockles of your heart and your hearth with the cherubic Poodle Angel Christmas Tree Topper. 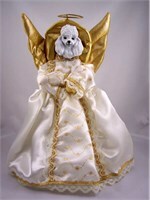 This divine dog will light up your home and holidays on an 11 inch, gold trimmed silk Poodle Angel Christmas Tree Topper for your tree or mantle. You can give these Poodle Angel Christmas Tree Toppers to friends, family and coworkers for a low, affordable price. With a face made of sturdy polynate, you will cuddle up to this Poodle for many years to come. Make it a new family tradition with the celestial sweetness of this dynamic, darling dog. 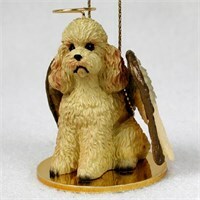 Celebrate the Christmas season with this adorable Poodle Angel Ornament Apricot Sport Cut. Our delightful Christmas Tree Ornament measures 2 inches tall and will brighten up your Christmas tree. Not all ornaments are as beautiful and unique as this one and when you hang it on your tree, it is sure to bring joy to all of your loved ones during the holiday season. Be prepared for compliments and admiration when you display this beautiful Poodle Angel Ornament Apricot Sport Cut. Don't forget about the Poodle enthusiast in your life, this ornament also makes the perfect gift! 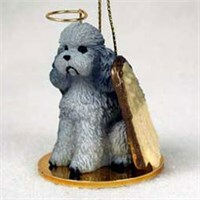 Celebrate the Christmas season with this adorable Poodle Angel Ornament Chocolate Sport Cut. Our delightful Christmas Tree Ornament measures 2 inches tall and will brighten up your Christmas tree. Not all ornaments are as beautiful and unique as this one and when you hang it on your tree, it is sure to bring joy to all of your loved ones during the holiday season. 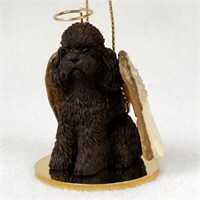 Be prepared for compliments and admiration when you display this beautiful Poodle Angel Ornament Chocolate Sport Cut. Don't forget about the Poodle enthusiast in your life, this ornament also makes the perfect gift! Add a touch of holiday cheer to your decor for years to come with this charming Little Drummer Poodle Apricot Sport Cut Christmas Ornament. The perfect stocking stuffer for everyone on your nice list, this adorable Ornament stands approximately 3-3.5 inches tall and is made to last out of durable Stone Resin. Hand Painted by skilled artisans with a fine eye for detail, friends and family will simply love receiving this Little Drummer Poodle Apricot Sport Cut Christmas Ornament as a thoughtful gift from you this hoiday season. 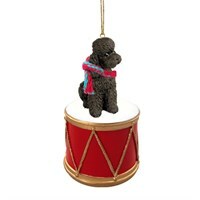 Add a touch of holiday cheer to your decor for years to come with this charming Little Drummer Poodle Black Christmas Ornament. The perfect stocking stuffer for everyone on your nice list, this adorable Ornament stands approximately 3-3.5 inches tall and is made to last out of durable Stone Resin. 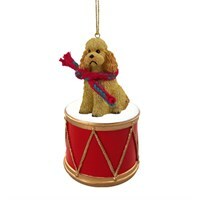 Hand Painted by skilled artisans with a fine eye for detail, friends and family will simply love receiving this Little Drummer Poodle Black Christmas Ornament as a thoughtful gift from you this hoiday season. 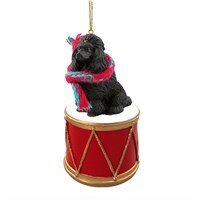 Add a touch of holiday cheer to your decor for years to come with this charming Little Drummer Poodle Black Sport Cut Christmas Ornament. The perfect stocking stuffer for everyone on your nice list, this adorable Ornament stands approximately 3-3.5 inches tall and is made to last out of durable Stone Resin. 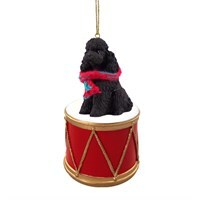 Hand Painted by skilled artisans with a fine eye for detail, friends and family will simply love receiving this Little Drummer Poodle Black Sport Cut Christmas Ornament as a thoughtful gift from you this hoiday season. Add a touch of holiday cheer to your decor for years to come with this charming Little Drummer Poodle Chocolate Sport Cut Christmas Ornament. The perfect stocking stuffer for everyone on your nice list, this adorable Ornament stands approximately 3-3.5 inches tall and is made to last out of durable Stone Resin. Hand Painted by skilled artisans with a fine eye for detail, friends and family will simply love receiving this Little Drummer Poodle Chocolate Sport Cut Christmas Ornament as a thoughtful gift from you this hoiday season. Nothing beats the exceptional look and quality of our Poodle Ornament. Among the finest made, you will be provided with great satisfaction and long lasting enjoyment. Why not pamper yourself or give a loved one a Poodle gift to show them how much you care. The Poodle Ornament will make the perfect gift for any Poodle lover. Shop with confidence, because all products come with a 100% customer satisfaction guarantee. Click over now to see the big selection of Poodle gifts we offer. Deck your halls and trim your tree with this sweet and colorful Poodle Gift Box Christmas Ornament Apricot. Our Poodle Gift Box Christmas Ornament Apricots are crafted from fine quality stone resin and feature a beautiful full color figurine. All of our Christmas ornaments are crafted for a lifetime of memories and make wonderful gifts, and these beautiful Poodle Gift Box Christmas Ornament Apricot are no exception. 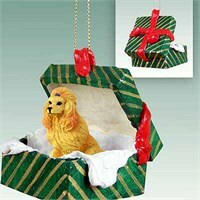 Deck your halls and trim your tree with this sweet and colorful Poodle Gift Box Christmas Ornament Apricot Sport Cut. Our Poodle Gift Box Christmas Ornament Apricot Sport Cuts are crafted from fine quality stone resin and feature a beautiful full color figurine. All of our Christmas ornaments are crafted for a lifetime of memories and make wonderful gifts, and these beautiful Poodle Gift Box Christmas Ornament Apricot Sport Cut are no exception. 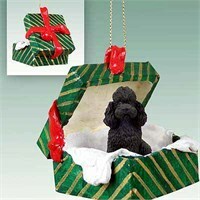 Deck your halls and trim your tree with this sweet and colorful Poodle Gift Box Christmas Ornament Black. Our Poodle Gift Box Christmas Ornament Blacks are crafted from fine quality stone resin and feature a beautiful full color figurine. All of our Christmas ornaments are crafted for a lifetime of memories and make wonderful gifts, and these beautiful Poodle Gift Box Christmas Ornament Black are no exception. 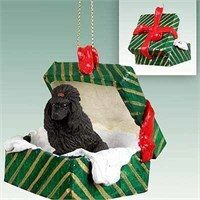 Deck your halls and trim your tree with this sweet and colorful Poodle Gift Box Christmas Ornament Black Sport Cut. Our Poodle Gift Box Christmas Ornament Black Sport Cuts are crafted from fine quality stone resin and feature a beautiful full color figurine. All of our Christmas ornaments are crafted for a lifetime of memories and make wonderful gifts, and these beautiful Poodle Gift Box Christmas Ornament Black Sport Cut are no exception. Deck your halls and trim your tree with this sweet and colorful Poodle Gift Box Christmas Ornament Chocolate Sport Cut. Our Poodle Gift Box Christmas Ornament Chocolate Sport Cuts are crafted from fine quality stone resin and feature a beautiful full color figurine. All of our Christmas ornaments are crafted for a lifetime of memories and make wonderful gifts, and these beautiful Poodle Gift Box Christmas Ornament Chocolate Sport Cut are no exception. 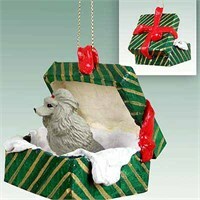 Deck your halls and trim your tree with this sweet and colorful Poodle Gift Box Christmas Ornament Gray. Our Poodle Gift Box Christmas Ornament Grays are crafted from fine quality stone resin and feature a beautiful full color figurine. All of our Christmas ornaments are crafted for a lifetime of memories and make wonderful gifts, and these beautiful Poodle Gift Box Christmas Ornament Gray are no exception. Deck your halls and trim your tree with this sweet and colorful Poodle Gift Box Christmas Ornament Gray Sport Cut. Our Poodle Gift Box Christmas Ornament Gray Sport Cuts are crafted from fine quality stone resin and feature a beautiful full color figurine. All of our Christmas ornaments are crafted for a lifetime of memories and make wonderful gifts, and these beautiful Poodle Gift Box Christmas Ornament Gray Sport Cut are no exception. Deck your halls and trim your tree with this sweet and colorful Poodle Gift Box Christmas Ornament White. Our Poodle Gift Box Christmas Ornament Whites are crafted from fine quality stone resin and feature a beautiful full color figurine. All of our Christmas ornaments are crafted for a lifetime of memories and make wonderful gifts, and these beautiful Poodle Gift Box Christmas Ornament White are no exception. Deck your halls and trim your tree with this sweet and colorful Poodle Gift Box Christmas Ornament White Sport Cut. Our Poodle Gift Box Christmas Ornament White Sport Cuts are crafted from fine quality stone resin and feature a beautiful full color figurine. All of our Christmas ornaments are crafted for a lifetime of memories and make wonderful gifts, and these beautiful Poodle Gift Box Christmas Ornament White Sport Cut are no exception. 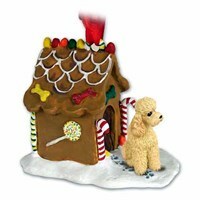 Deck your halls and trim your tree with this sweet and colorful Poodle Gingerbread House Christmas Ornament Apricot. Our Poodle Gingerbread House Christmas Ornament Apricots are crafted from fine quality stone resin and feature a beautiful full color figurine. All of our Christmas ornaments are crafted for a lifetime of memories and make wonderful gifts, and these beautiful Poodle Gingerbread House Christmas Ornament Apricot are no exception. Deck your halls and trim your tree with this sweet and colorful Poodle Gingerbread House Christmas Ornament Apricot Sport Cut. Our Poodle Gingerbread House Christmas Ornament Apricot Sport Cuts are crafted from fine quality stone resin and feature a beautiful full color figurine. All of our Christmas ornaments are crafted for a lifetime of memories and make wonderful gifts, and these beautiful Poodle Gingerbread House Christmas Ornament Apricot Sport Cut are no exception.